US President Donald Trump and his cohorts in Congress have vowed to revive rural America by eliminating what he claims are burdensome environmental regulations, but the best that can be said about the initiatives launched so far is that they might boost profits for some of the energy and agriculture interests that support Republicans on the House Resources Committee. You can't, however, say they'll create more jobs than they destroy, because profits aren't jobs. In fact, they're often the opposite: companies save money by cutting jobs, and in this case, the jobs they cut will be those that pay people to plant trees, restore rivers, and turn soggy, unproductive farms into wetlands that filter water, purify air, and slow climate change. 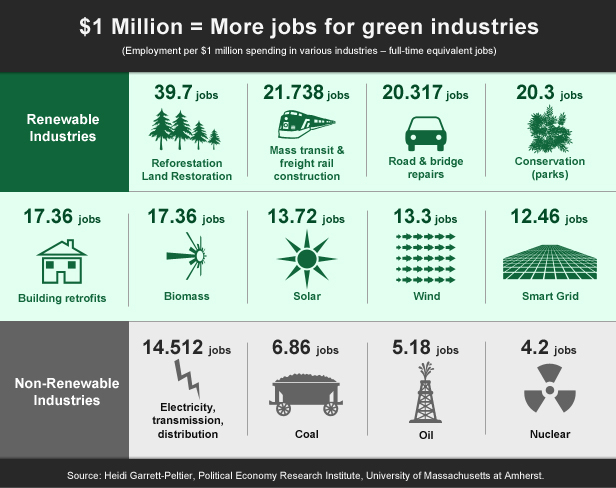 Those jobs are part of a $25 billion "restoration economy" that directly employs 126,000 people and supports 95,000 other jobs - mostly in small businesses - according to a 2015 survey that environmental economist Todd BenDor conducted through the University of North Carolina at Chapel Hill. that employs 374,000 people in solar parks and 101,738 on wind farms. Like those, however, the restoration economy is part of a burgeoning "green economy" that's transforming forests, farms, and fields around the world. now because they provide a cost-effective way to produce electricity, which everyone needs. The demand for restoration, however, isn't as automatic as the demand for electricity is, because most companies and even some landowners won't clean up their messes without an incentive to do so. Economists call these messes "externalities" because they dump an internal responsibility on the external world, and governments are created in part to deal with them - mostly through "command-and-control" regulation, but also through systems that let polluters either fix their messes or create something as good or better than what they destroy. Pioneered in the 1960s, environmental markets offer flexibility in meeting commitments. That local government mentioned above, for example, can either restore the land itself, or it can turn to a "
These are usually created by green entrepreneurs who identify marginal land and restore it to a stable state that performs ecosystem services like flood control or water purification. 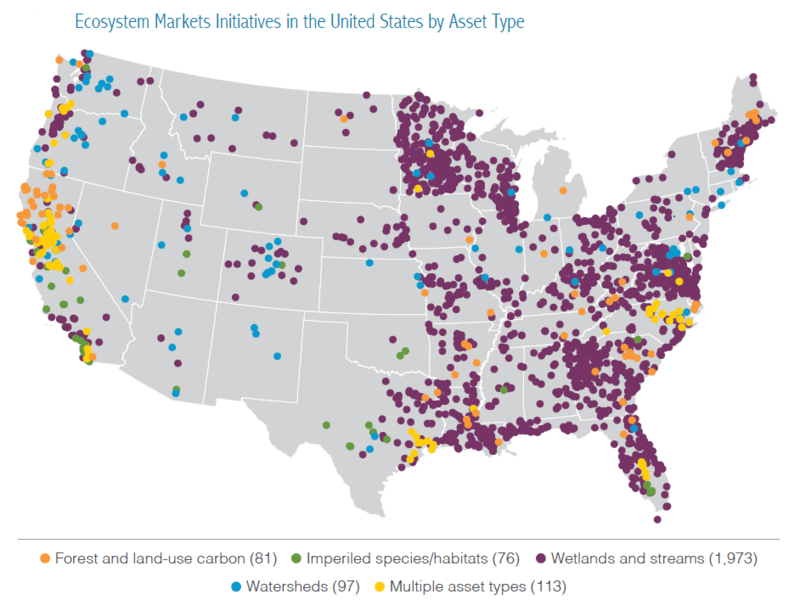 They make money by selling credits to entities - personal, public, or private - that need to offset their environmental impacts on species, wetlands or streams. , as do many states. Government activities alone support thousands of restoration jobs. Government agencies are big buyers of credits, often to offset damage caused by infrastructure projects, but the link between infrastructure and restoration goes even deeper than that. In Philadelphia, for example, restoration workers are using water fees to restore degraded forests and fields as part of a plan to better manage storm runoff. In California, meadows and streams that control floods are legally treated as green infrastructure, to be funded from that pot of money. "Green infrastructure", it turns out, is prettier than concrete and lasts longer to boot. Trump wants to "expedite" infrastructure roll-outs, and he can do so without weakening environmental provisions by removing unnecessary delays in the permitting process (see point 11, below). in new subdivisions along waterways. "They're supposed to prevent erosion, but they often fail or are put in the wrong places," he says. "Markets can simply enact a limit on erosion, allowing the landowner the freedom to be creative and efficient in any way they see fit in order to meet that limit." "Markets are entirely reliant on strong monitoring, verification, and enforcement of limits," says BenDor. "Provisions must be made to ensure that, but in reality it's often a problem." In 2015, BenDor published a study called "
", which found restoration businesses in all 50 states. California had the most, but four "Red" states filled out the top five: Virginia, Florida, Texas, and North Carolina. Last place went to North Dakota. 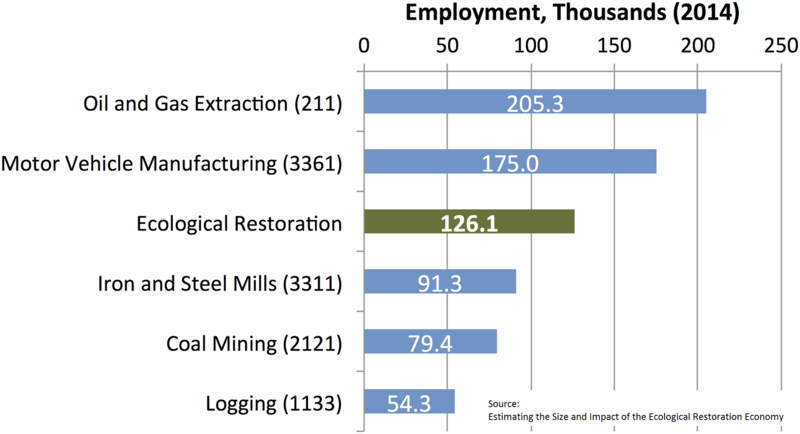 "The jobs created by restoration activities are located mostly in rural areas, in communities hard hit by the economic downturn," report authors wrote. "Restoration also stimulates demand for the products and services of local businesses such as plant nurseries, heavy equipment companies, and rock and gravel companies." America lost in the last decade. BenDor's research shows restoration jobs are evenly divided between white-collar planners, designers, and engineers and the green-collar guys doing the actual earth moving and site construction. Almost all involve time in the great outdoors, and they can't be exported or done by robots. or even changed in a major way to protect habitat. While the Fish and Wildlife Service administers credits for mitigation of endangered species, the Army Corps of Engineers approves mitigation credits for streams and wetlands, and they're notoriously underfunded. This leads to long and costly delays, according to unpublished research that BenDor conducted with Daniel Spethmann of Working Lands Investment Partners and David Urban of Ecosystem Investment Partners.